The fellowship grant from the Graduate School of Geosciences gave me the opportunity to submit two additional papers to peer-reviewed journals for my PhD thesis. The topic of my thesis are chondrites (primitive meteorites), which are important archives that provide information about the early solar system and the material from which earth and the other planets formed. Most of all found meteorites are chondrites (~85%). Because their components formed during the birth of the solar system (ca. 4,567 Ma) and have not been modified due to melting or differentiation of the parent bodies, they provide the best clues to the origin of the solar system. In addition, their abundances of nonvolatile elements are close to those in the solar photosphere. As the sun contains 99% of the mass of the solar system, it represents the chemical composition of the solar system. 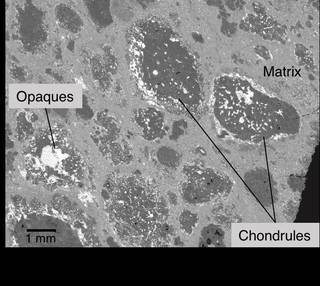 The two main components of chondrites are chondrules and matrix. Chondrules are rounded, once molten silicate particles up to 1mm in size. The matrix in meteorites is an optical opaque mixture of small grained minerals (10 nm to 5μm). How these components were formed is still uncertain and especially on the formation of chondrules, with which meteoritics has been obsessed for more than 100 years, many different models exist. The two papers which I submitted during the funding period of the GSGS give important constraints to the physical and chemical conditions in the early solar system. 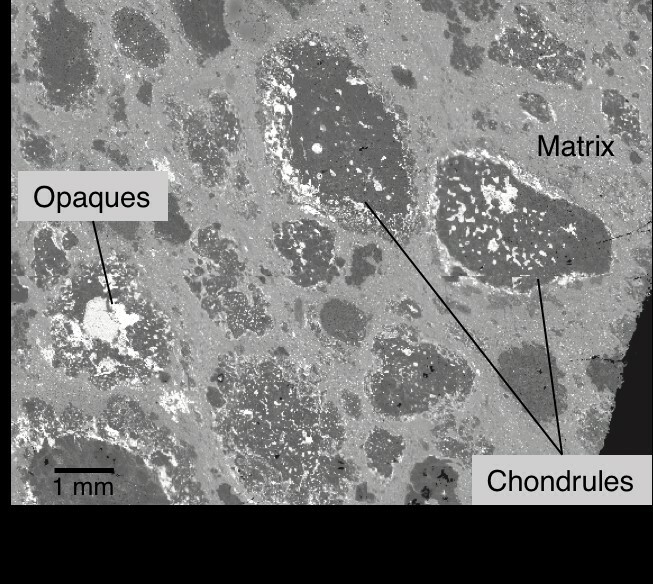 They show that chondrules and matrix must have formed in a single chemical reservoir and thus contradict any theory arguing for their formation in distinct regions. • Friend P., Hezel D. C., Barrat J. A., Zipfel J., Palme H., and Metzler K. (submitted for publication). Composition, petrology and chondrule-matrix complementarity of the recently discovered Jbilet Winselwan CM2 chondrite. Meteoritics and Planetary Science. • Friend P., Hezel D. C., Palme H., Bischoff A., and Gellissen M. (submitted for publication). Complementary element relationships between chondrules and matrix in Rumuruti chondrites. Earth and Planetary Science Letters.